And the public "servants" (now referred to by LAAG as the "public aristocracy") is starting to feel the pressure of these problems. But not to fear. City employees are very good at ignoring the public, dismissing them with belittling comments (to their face or behind their back) and basically telling them they know nothing and to go away. This is all done in a very "politically correct" fashion of course. We have even seen elected politicos go so far as to ask LAAG to praise the city employees for doing their job with our tax money (tax money to pay the employee for working and tax money to fix the infrastructure)! How is that for absurd! And all because the PROBLEM is directly attributable to them wasting our tax dollars and at the same time failing miserably to DO their job over the last 30 years! Then the public servants sit there in amazement as to why "these people" complain and why they are so cynical. Typically voters/taxpayers complain about infrastructure problems via phone call. That's useless. Might as well call your aunt and complain to her. Records of those calls/complaints are gone the minute you hang up. How about emails you ask? Well those are typically "erased" as well or at least they will be if there is ever a lawsuit due to an injury. Cities are loathe to keep them for fear someone might find out that they actually KNEW about a problem and failed or more likely "refused" to fix it even though it involved public safety and could be remedied for very little of OUR tax dollars. As you can see from the email below we complained (on June 1, 2014) about some very dangerous potholes right in the area where bicycles ride, especially large groups. This condition has slowly gotten worse over the last 6 months with the tiny bit of rain we did get this spring. The city that is responsible (Azusa) really did not come out and say that this southern section of the roadway was their responsibility but the border city (Covina) which claims it had no responsibility over that roadway section put the blame on Azusa! Way to go Covina! "Yes that section of the roadway in your email is our responsibility. We are sending a crew out there in the next two days to assess the situation and will make emergency repairs as warranted that same day. Once they are complete we will send you and email indicating they are complete. Once that is done please let us know if we solved the dangerous condition at least temporarily." (they don't even have to thanks us even though unlike the (grossly over compensated) public servants LAAG does this for NO compensation. But instead we got a bunch of dismissive backtalk (by one of the top Public Works people) about how we are not doing anything that helped the situation, and that the prior problem we alerted them to was also of no help, (even though they did exactly what we told them to do a year later), no thanks for calling it to their attention and basically dismissed us as bothering them. Again public servants transformed into public aristocracy. We did note that the paving in front of Azusa City Hall is new and pristine!! What a coincidence!! The thought in government these days is that all the "good ideas" come from government. They know it all. Nothing good (ideas or observations) can ever come from taxpayers that actually understand the problem better than the city does as taxpayers have to deal with it on a daily basis. Bicycle riders unfortunately know the problems with roads much better than the public "servants" who never ride bikes on their own roads. Bicycle riders see all the potholes and defects right up close at speeds slower than cars. The potholes in these photos wont affect most cars and motorcycles nearly as much as a bicycle. The bicycle wheel in the photo does not do these holes justice. Some of them are 2 inches deep or more. You ride into these holes at 25 mph on a bicycle you are in for a nasty spill and then a car will run you over as you lay there. The failure of our infrastructure is much more dangerous to cyclists than to car drivers. The city people apparently don't get that (or more likely don't care) as they don't ride. The repairs we are/were asking for would take a city crew 30-45 minutes to patch. Now granted the city may need to check on the patches after a rain but we don't have to worry about that for 5 months and then about 3 x a year. In the meantime a serous injury could easily have been prevented. But instead the condition still exists as of this posting. Sure we understand that it takes months and years to play catchup after "ignoring" road decay problems for years (well ignoring with money, not with lip service especially during campaigns). But we are asking for a temporary fix. Apparently the city does not care enough about public safety to make a 30 minute fix. We are too "busy" go away. Well the people that run this website are too busy as well but we find the time when it comes to issues like this. So given that calls and votes do nothing, emails are destroyed or never "found" we feel that our website must do the only responsible thing it can...notify the public of the situation and its attempts to get it fixed by city leaders and staffers. We take this stuff very seriously as hitting the pavement with your face at 25 mph hurts a lot. If using this website to call attention to this problem in this way is what we have to do to get it fixed, then so be it. That is what the web is for. We don't want any government agencies to be able to use the very effective "no one ever told us" defense, which unfortunately works very well and the government agencies use it very effectively every day. They have for years. Well that won't work here in this situation that's for sure. Because once someone gets hurt on this street they will google it and guess what a bonanza they will find in this posting. Hopefully it will yield punitive damages as well where the government agency's employees have demonstrated a "conscious disregard" for safety. Only then will government entities (and their employees) learn to to act properly and promptly in the face of dangerous conditions reported to them. Our emails and their recipients are set forth below. The two responses were mostly meaningless and not to the point (as set forth above) and we don't want to further embarrass the senders at this point in this forum. Again the point is we told them what to do, how to fix it, where it was and why it was dangerous. Nothing else matters after that given the cost to repair is negligible. ​ Unfortunately once again local cities need to be reminded of their obligation to keep roads in good condition. Every Saturday (for that last 20 years) hundreds of bicycle riders head eastbound on the south side of E. Arrow highway to make a left turn on Northbound Cerritos Ave. Every sat. All year. (and yes thank you Azusa for repaving Cerritos Ave upon our request after 30 years of neglect) The section of Arrow Hwy from S. Azusa Ave to Cerritos Ave​ has a number of areas where large chunks of asphalt have been broken out of the surface due mainly to the roadway slowly disintegrating. If the city feels that it does not need to spend sizeable portions of its budget every year keeping its roads properly resurfaced (due to years of failure to do this maint. ), then it needs to run a monthly or weekly "road patch team" over all its roads to insure potholes and other road defects are fixed rapidly. If a bicycle hits one of these potholes there will very likely be a crash of 10 or more people given the size of the group that takes up most of the entire 2 eastbound lanes of E Arrow Hwy.. Im just making you aware of this now in writing so you cant later deny you did know of the dangerous condition. That way when you get sued this email will show up. It completely baffles me how derelict cities are in their ethical and legal responsibilities instead relying on the "oh we never new about it defense" well thats gone now. No more excuses. I like to call it "municipal malpractice". It appears that that section of Arrow Hwy is divided between Covina and Azusa. (yet another opportunity cities use to dodge responsibility) I have to assume that Covina has responsibility for the south half of the road but can't be sure from google maps. Thats your problem to figure out between the two of you. However just to be sure I have put both cities on notice. 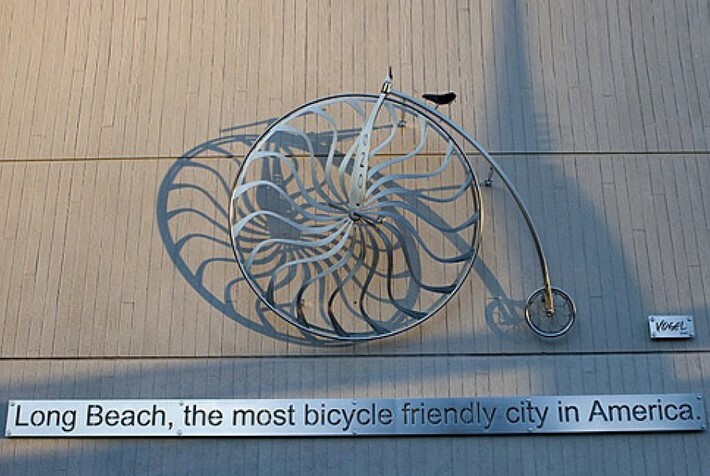 ​ We totally support bicycle infrastructure "creation". But over the years we have noticed there there seems to be more enthusiasm for "new" projects (maybe as a way to get votes, who knows) and less enthusiasm for "maintaining" what is already in place as that again is "boring" and not viewed as much by voters as a reason to vote for a candidate. Also when a new project is created there never seems to be a set aside to maintain that project over the next hundred years​. I keep telling cities. Take the money from the feds. (11% chance of passing) https://www.govtrack.us/congress/bills/113/hr3978?utm_campaign=govtrack_email_update&utm_source=govtrack/email_update&utm_medium=email But the feds are guilty of the same problem. Only money for new stuff not fixing and maintaining old. Unfortunately with local govt we voters have found that using the stick approach works better than the carrot. We also find out only after prodding that much of this work re maint going on behind the scenes and is never posted on the website. It also crawls at a snails pace compared to most things. Post a chart with all the sections of all major streets and when they are due for resurfacing or when last resurfaced. I know that usually exists. just hidden from view? why? The internet is a (mostly) free resource. Use it for REAL info dissemination. I really don't know why this is not fixed yet (after 18 days written notice which was acknowledged). this an item that does not need budgeting (so I don't want to hear that excuse) and takes 30-60 minutes of employee time. this is routine repair that needs to be expedited as it involves public safety.